Kenny Wetzel started dancing as a teenager in East Saint Louis, IL. He and his sister became known as the best Swing dancers in all of Illinois. Kenny was known as the “King of Flying Lindy” and the “King of St. Louis Shag.” In the 1950’s Kenny moved to Glendale California with his mother, sister and nephew, Mike. Here he met many Swing dancers and started teaching for the Arthur Murray studios. Kenny was well versed in all styles of dance and he excelled in both Swing and Latin dancing. His natural talent won many dance contests, including the Harvest Moon Ball. In the 1960s and 1970s, Kenny hosted many dances and was one of the very first DJ’s to spin records here in the United States. Kenny is well known for his Swing dance formats but many don’t realize that he was also a D.J. at many other dance venues such as Hustle and Latin. Kenny became very popular with the Swing dancers for his work at several clubs in the Los Angeles, CA area, such as the “Water Wheel” in Covina, the “Ivanhoe Lounge” in Temple City, and the legendary “Staircase” in Downey. This would prove to be his special calling in life, for no one could spin music as well as Kenny Wetzel! 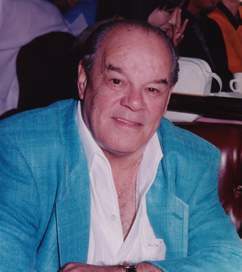 Kenny formed the Rebels Swing Dance Club in Orange County with Dino Restlli and Al White in 1972, and later joined Sonny Watson in many LA nightclubs. Kenny’s Dance Club was so popular that clubs throughout the country franchised Kenny’s club name. Kenny was the Emcee or D.J. to almost all Swing Events throughout the country, including the U.S. Open Swing Dance Championships (which he Emceed for 18 years). Through his dancing, choreography, teaching, emceeing, “D.J.ing”, and support of many dancers and competitors, Kenny probably did more to keep Swing dancing alive than anyone in those years. As a leader in the Swing Dance Community, Kenny supported everyone who was into dancing and knew just about everyone in the dance community. He helped choreograph several winning Swing dance routines for some of the best names in the Swing Dance World. After being a D.J. and Emcee for over 25 years, Kenny semi-retired in November of 1998. He passed on in March of 2000 at the age of 71 from a brain tumor. Just before he passed away, Kenny wrote the book, Our World with Rhyme and Reason that was published by Dorrance Publishing Company in November of 2000. Many who knew Kenny sadly miss him, and today, those who never knew him unknowingly benefit from Kenny Wetzel’s life in dance.